The Junior Competition & Sportsmanship Committee of the USTA had a positive and productive meeting in Dallas from February 26 to February 28 regarding the 2014 National Junior Competitive Structure. During this meeting the committee reviewed feedback received at the Listening Sessions and the Letusknow.com e-mail address. This included comments from key stakeholders including parents, coaches and players, tournament directors, teaching professionals, college coaches, USTA sections and other tennis constituents. The proposed changes developed during this meeting were unanimously approved by the committee and will be presented to USTA National and Section Leadership on or about March 6, 2013. These proposed changes will be vetted by USTA Leadership at the USTA Annual Meeting, March 16-18, 2013, and then presented to the USTA Board shortly thereafter. Other than the obvious message that the committee will not be starting over, which is the result many of us had hoped for when the USTA first "paused" the 2013 changes, there's not much more to be said about this until the exact "changes" are revealed. Unfortunately, that doesn't appear to be before they are given the stamp of approval by the sections and the board, so any objections will be, once again, after the fact. That method didn't work out very well last year, but I suspect changing the governing method of the USTA was a bridge too far in this particular battle. Keep an eye on the Parenting Aces blog and on the Stop the USTA 2014 Tennis Changes Facebook page for possible additional updates. The ITA Women's Division III Team Indoor begins Friday in DePauw, Ind., with, as was the case in the men's tournament last weekend, a field without all of the top teams. Here are the participants, by seeding, with their preseason national rankings in parentheses. The draw, preview and live scoring can be found at the ITA tournament website. 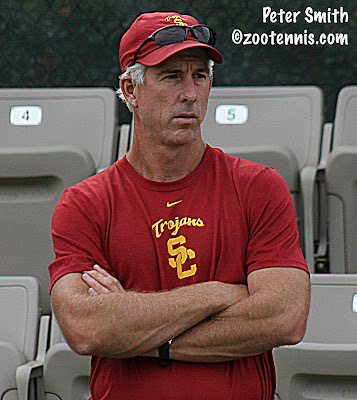 USC coach Peter Smith and Furman coach Kelly Jones are seeded fifth at the Pacific Coast Men's Doubles Tournament this weekend. In the 128-team draw, there are two of each seed. The No. 1 seeds, are Cal's Campbell Johnson and Christoffer Konigsfeldt, the No. 1 college seeds, and Stanford's 2004 NCAA champion KC Corkery and his partner Blake Muller, the No. 1 independent seeds. 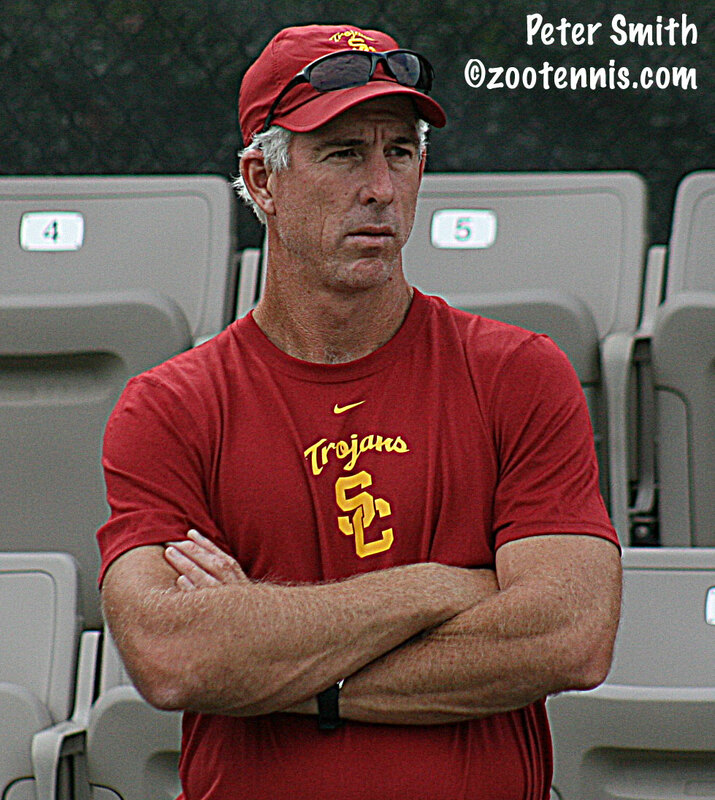 USC coach Peter Smith and Furman coach Kelly Jones are playing together and are one of the No. 5 seeds. Ken Thomas will be again be providing coverage Sunday at radiotennis.com. Results will be updated at the TennisLink site. With the long, cold, snowy winter we've had in Michigan, it's hard to believe spring, and the two big pro tournaments in this country, are just days away. The BNP Paribas Open in Indian Wells, which begins next Tuesday, announced its wild cards today, for both the main and qualifying draws. Qualifying wild cards go to the winners, and often the finalists, of the pre-qualifying tournament, which is now underway (pdf draws are here). The complete release announcement is here. It contains two errors that I noticed, saying that Memphis was Sock's first ATP quarterfinal when he actually reached the quarterfinals last summer at the ATP's Atlanta tournament. And Madison Keys just turned 18, not 19. 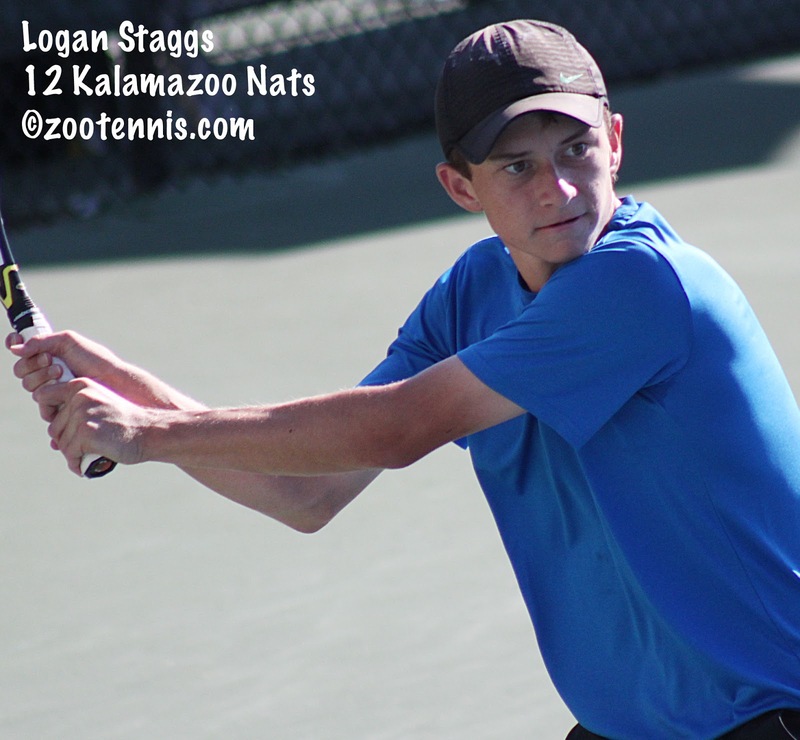 In a much more timely fashion than the last set of them, here are the results from the USTA National Opens that finished (mostly) earlier this week. Two sites and three divisions were not able to complete their tournaments due to rain. The season's first computer-generated ITA Division I rankings came out today and there were no changes at the top, with the North Carolina women holding a substantial lead over new No. 2 Duke, and the Virginia men keeping well ahead of No. 2 USC and No. 3 UCLA, both of whom retained their positions. The margin separating the Trojans and the Bruins is .27 of a point, which is an accurate depiction of just how closely matched the two teams are, with each winning a dual from the other by taking a third-set tiebreaker in the last match on. Ohio State fell from 4 to 7, with Duke moving up to the No. 4 spot. It's too early to make any statements about the quality of the teams or of the rankings, but it is strange to see all four Stanford and Baylor teams so far down the lists. The Stanford women are 26th and the Stanford men are 41st. The Baylor women are 24th and the Baylor men are 26th. The Auburn women made a huge leap from 59 to 17 after a win over Texas Tech, and it's the first time since 1996 that they've been in the Top 25. Cornell was the big mover on the men's side, going from 63 to 24, despite not playing last week. There's a new No. 1 in the women's rankings, but hardly a surprising one, with Florida's Lauren Embree taking the top spot, just edging out Robin Anderson of UCLA. Alex Domijan of Virginia remains No. 1 in the men's rankings by a wide margin over Peter Kobelt of Ohio State. And yes, the top two players in the country play No. 2 in their teams' lineups. It should be noted that the Buckeye No. 1 Blaz Rola, who took the fall off, has gone from no ranking to No. 17 this week. The top doubles teams are USC's Sabrina Santamaria and Kaitlyn Christian and Auburn's Daniel Cochrane and Andreas Mies. The complete rankings can be found at the ITA website. An article last week in the Omaha World Herald brings out in the open a rumor that has been circulating for months in college tennis circles: the city is interested in becoming a permanent host for the NCAA Division I men's and women's tennis tournaments. The Omaha Multi-Sport Complex organization is building an Olympic-sized swimming pool and included in the plans are a tennis facility with 18-24 outdoor and 6-12 indoor courts. This project is obviously in its early stages, with the site not even selected yet, and there is no commitment from the NCAA, who currently takes bids for the tournament and selects a host school. The mention of the Indoor tournaments is a bit confused, because the NCAA is not involved at all in those tournaments; they are administered by the Intercollegiate Tennis Association. They would certainly need 12 indoor courts to host the Division I tournaments, which feature 16 teams over four days. I've never been to Omaha, which is the longtime site of the NCAA College World Series, so I don't have an opinion on its suitability for tennis. I do know the move of the USTA/ITA Indoor Intercollegiate Championships to the Bille Jean King Tennis Center in New York has been popular with players and coaches, with both the facility and its proximity to all the attractions of New York, including the airport, a big part of its appeal. Omaha would have to come up with its own reasons for being a desirable destination, but they've proven to be able to do that with college baseball. 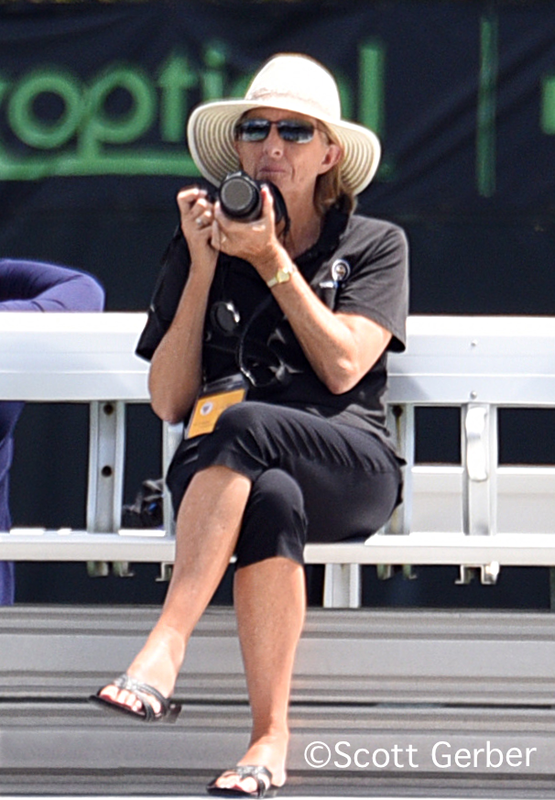 Sandra Harwitt is covering the Delray Beach ATP event, and she spoke to James Blake after his loss to Ernests Gulbis today for TenniShorts.com. He gives advice about playing college tennis, and although I don't agree with him that if you dominate college tennis you wouldn't be dominating in Futures--I think the levels are similar--he does offer some practical advice about making the decision based on his experience and the experience of his ATP contemporaries. Fourteen-year-old Nathan Ponwith won his first ITF junior titles in El Salvador lost week, taking the Grade 4 Copa Gatorade Internacional without dropping a set in singles. Ponwith, the No. 11 seed, defeated top seed Alan Nunez Aguilera of Mexico 7-5, 6-2 in the singles final, after defeating No. 2 seed Ugo Santomenna of France in the semifinals. He and Jack Van Slyke of Canada, seeded fifth, collected the doubles title by the impressive score of 6-4, 3-6, 18-16 over top seeds Nunez Aguilera and Stefan Gonzalez of Guatemala. 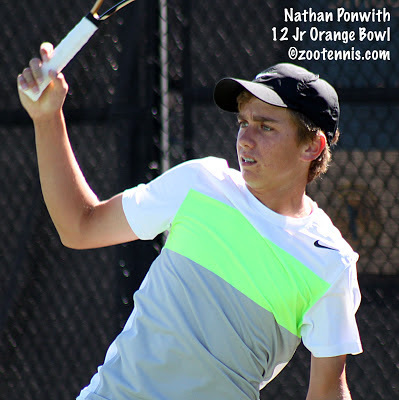 Ponwith, who reached the semifinals of Teen Tennis, Les Petits As and the Junior Orange Bowl in 2012, is continuing his Central American tour at the Grade 4 in Guatemala this week. The unseeded American team of Meghan Kelley and Claudia Wiktoren won the girls doubles title in El Salvador without the loss of a set, defeating unseeded Marie Bouzkova of the Czech Republic and Ialita Devarakonda of Italy 6-1, 6-1 in the final. The USTA today announced the American juniors participating in the upcoming South American swing, which includes the Grade 2 Copa Milo this week in Chile, the Grade 1 Asuncion Bowl in Paraguay next week, followed by the Grade 1 Banana Bowl and Grade A Copa Gerdau in Brazil in consecutive weeks. For the release, see this document. 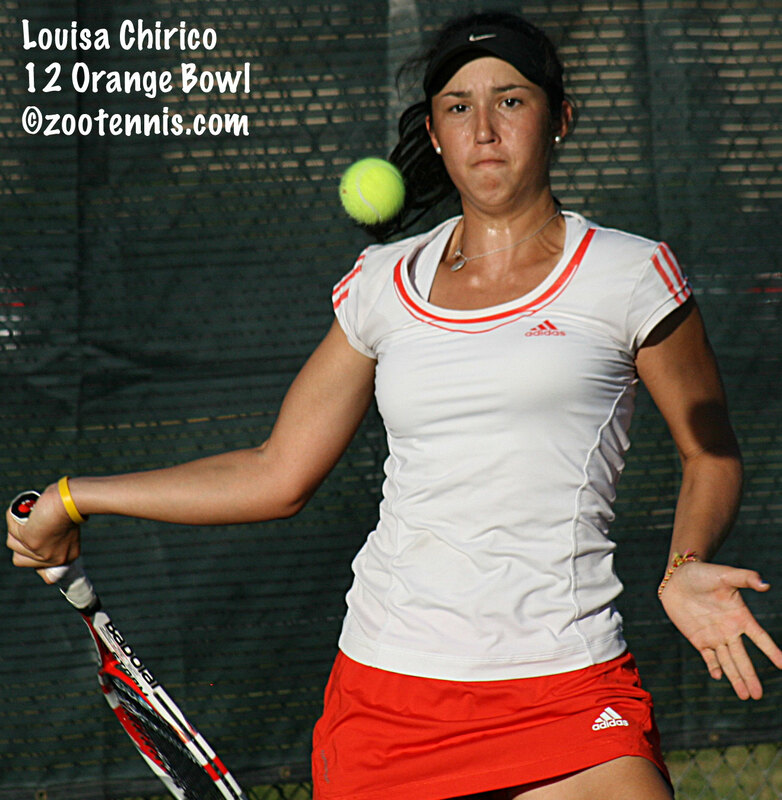 Louisa Chirico is one of those mentioned as on the South American trip, but as she just finished a stretch of eight matches to reach the final of the $25,000 Surprise, Arizona Pro Circuit event, losing to Tara Moore of Great Britain 6-3, 6-1 in the final, I suspect she will be arriving later in the trip. In fact, many of those named in the release are not in the draw in Chile this week. Rounding up the results in Surprise and in the men's Futures in Brownsville, teens Samantha Crawford and Sachia Vickery won the doubles title, defeating Emily Harman of the US and Yi-Fan Xu of China 6-3, 3-6, 10-7 in a final between two unseeded teams. The Brownsville Futures singles title went to veteran Rik De Voest of South Africa, the No. 4 seed, who defeated No. 3 seed James McGee of Ireland 7-6(6), 6-1. The doubles title went to Dennis Nevolo and Jean-Yves Aubone, who defeated Ruben Gonzales of the Philippines and Chris Letcher of Australia 6-3, 6-7(7), 10-6. The Brownsville Herald published this article on the doubles final. There is no women's tournament in the US this week, while the men are in Harlingen, Texas for another $15,000 Futures. The qualifying is now complete and results and draws are here. The pre-qualifying for the big WTA/ATP event in Indian Wells is underway, with Samantha Crawford, Sachia Vickery and Mayo Hibi among those vying for a qualifying wild card. The draws for the event, which began today and runs through Saturday, are available here. (Updated draws here: http://www.bnpparibasopen.com/Events/Calendar-of-Events.aspx). According to information on twitter, Taylor Townsend and Maria Sanchez have received main draw wild cards, although the tournament has not made a formal announcement of its wild cards. In the WTA events, a few notable American results. Former Penn star Connie Hsu qualified for the main draw in Florianopolis Brazil with a 4-6, 6-1, 6-3 win over WTA No. 178 Julia Gushko of Israel and was just underway in her main draw match with 16-year-old Brazilian wild card Beatriz Hadad Maia when rain washed out play for the day. In Acapulco, Grace Min beat Shelby Rogers, Canada's Stephanie Dubois(6) and Austria's Yvonne Meusburger(4) in qualifying to reach the main draw. Reigning Wimbledon girls champion Eugenie Bouchard of Canada, who won the Wimbledon girls doubles title with Min in 2011, also qualified today. The ATP Delray Beach qualifying was completed today, with Tim Smyczek, Bobby Reynolds, Ernests Gulbis of Latvia and Daniel Munoz-De La Nava of Spain reaching the main draw. With the possible exception of the weather, the inaugural College MatchDay featuring No. 4 Florida and No. 13 Stanford was a rousing success, with the Gator women downing their rivals from Palo Alto 4-2. With the score 2-2, rain descended on Gainesville, moving the remaining three singles matches into the Gators' newly completed three-court indoor facility. Not built to accommodate the 1033 fans who watched the first three hours of the match, the new facility served its purpose of allowing completion of the match. But with no seating, and Ken Thomas unable to resume his audio report at radiotennis.com, the details of the end of the match are not quite as vivid as those from the beginning. The match didn't start well for Florida, with Stanford pulling away to take the doubles point with wins at No. 1 and No. 2. 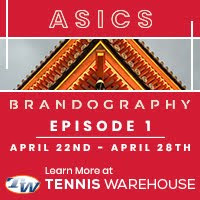 Stacey Tan and Ellen Tsay beat Danielle Collins and Olivia Janowicz 8-5 at line 2 and almost immediately after the completion of that match, Nicole Gibbs and Kristie Ahn defeated Lauren Embree and Sofia Oyen 8-4 at line 1. In singles, Florida got an early boost from Janowicz, who took a big lead over Lindsay Kostas at No. 6, and she was able duplicate her performance in the second set, posting a 6-2, 6-2 win to give Florida its first point. Within 10 minutes of Janowicz's victory over Kostas, two more 6-2, 6-2 decision were posted, with Tsay taking out Collins at No. 5 to make it 2-1 Stanford, then Oyen completing her victory over Ahn at 2. Within five minutes of Oyen's win, the rain began, with the other three matches in their second sets. The marquee match was at No. 1, where two-time NCAA Most Outstanding Team Player Lauren Embree was taking on reigning NCAA singles and doubles champion Nicole Gibbs. Ken Thomas was calling that match and the intensity from both players on every big point came through loud and clear over his court microphone. Gibbs took the first set 6-4, winning the final four games of the set, and they were on serve early in the second when the match went indoors. 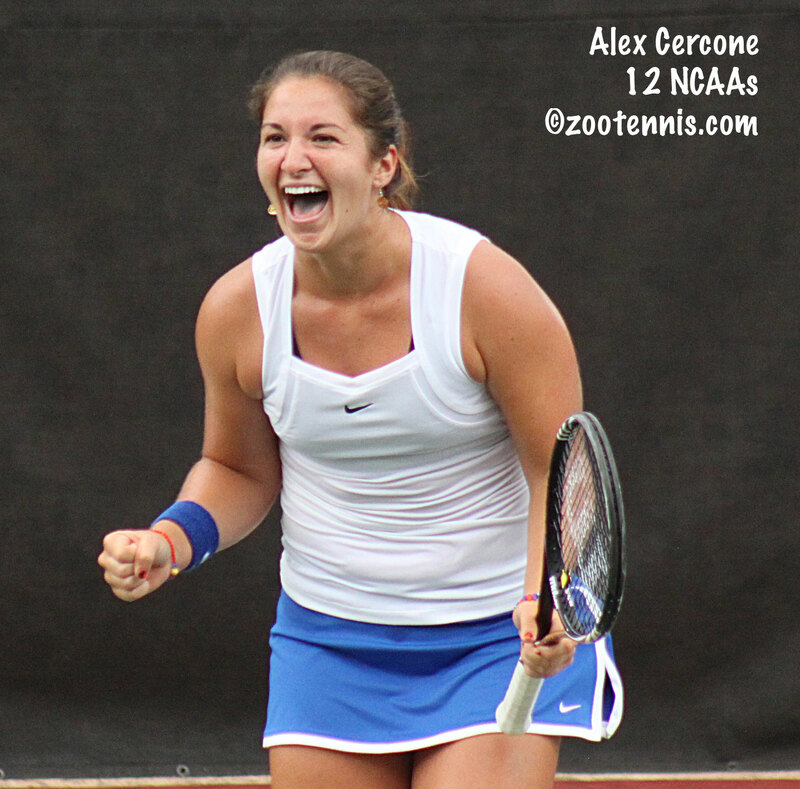 Florida's Alex Cercone, who had lost the first set to Krista Hardebeck at line 3, was had seen her 4-2 second-set lead disappear, with the score 4-4 when the rain arrived. At line 4, freshman Brianna Morgan and Tan were early in the second, with Morgan having won the first set 6-4, while Embree was leading Gibbs 2-1 in the second. Cercone was the first to earn a split, taking the second set from Hardebeck 6-4. Tan followed by taking her second set from Morgan 6-3, and Embree earned a third set by breaking Gibbs serving a 4-5. Those of us who have seen Gibbs and Embree play for the past half dozen years were hoping and expecting that the match would come down to them, as both have well-deserved reputations as tenacious fighters who never know when they're beaten. That didn't happen, with Cercone coming back from down 2-0 in the third set to beat Hardebeck 4-6, 6-4, 6-3 and give Florida a 3-2 lead. Morgan had taken control in her match with 2011 NCAA finalist Tan leading 5-2 in the third set, while Gibbs and Embree were at 2-2 in the third. Morgan had a chance to serve out the match at 5-3, but she was broken at love. A quick check of the status at No. 1 showed Gibbs up a break, but that had meant little throughout the match, with holds infrequent. Morgan earned one match point at 30-40, which Tan saved, but when the freshman got her second match point, she converted it, taking a 6-4, 3-6, 6-4 victory and delivering Florida's 4-2 win. It was another exciting chapter in the best rivalry in women's college tennis, but its implications for the NCAA tournament are not exactly clear. Last year Stanford beat Florida in a February dual match in Palo Alto, but it was the Gators who went on to claim the NCAA title in Athens in May. With the Pac-12 and SEC seasons beginning soon, both teams have many more tests ahead. For a complete account of the match, see the Florida athletic website Gatorzone's coverage. The men's Division III Team Indoor Championships were played this weekend in Minnesota, with No. 2 seed Kenyon defeating No. 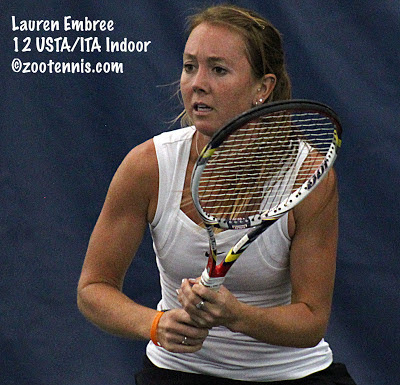 1 seed and defending champion Emory 5-4, with the match decided in a third-set tiebreaker, just as the ITA Division I Women's Team Indoor was. C.J. Williams of Kenyon defeated Elliot Kahler of Emory 5-7, 6-3, 7-6(4) to win give the Lords the first team title in program history. The ITA's detailed account of the match can be found here, and the box score of the final is here. The NESCAC (New England Small College Athletic Conference) schools do not play due to conference rules. CMS has not played by choice, and Wash U chose to decline this year as well. So it appears a tournament can continue without the participation and support of all of the top schools without losing any legitimacy. If you are interested in Division III men's college tennis as it works its way toward this year's NCAA tournament at Kalamazoo College, please check out the Division 3 Tennis blog. Sixteen-year-old qualifier Louisa Chirico of New York picked up the best win of her career Saturday to reach the final of the $25,000 Pro Circuit event in Surprise Arizona. Chirico, who trains at the USTA National Center in Flushing Meadows, defeated top seed and former WTA No. 25 Jarmila Gajdosova of Australia 3-6, 6-1, 6-3, winning the last four games of the match. Gajdosova, who reached the fourth round at both Wimbledon and Roland Garros in 2010, is now ranked 164. Perhaps the most impressive part of Chirico's seven wins this week is that she dropped the first set in all four of her main draw victories. She will play unseeded Tara Moore of Great Britain in Sunday's final. Chirico already has a Pro Circuit title to her credit at the $10,000 tournament in Sumter SC last year, where she qualified and won nine matches, beating Vicky Duval in the final. It's hard to imagine two teams more evenly matched than the USC and UCLA men, who again needed a third-set tiebreaker in the last match on to determine the winner on Friday. Last week, USC's Roberto Quiroz defeated UCLA's Adrien Puget in a third-set tiebreaker give the Trojans a 4-3 win and a berth in the ITA Men's Team Indoor final. Last night, the Bruins went into USC's Marks Stadium and came away with a 4-3 win, with Marcos Giron of the Bruins outlasting Emilio Gomez in a third-set tiebreaker at No. 2 singles to take a 4-6, 7-5, 7-6(3) victory. As UCLA coach Billy Martin says in this UCLA release, "it's as close as I've seen the UCLA-USC rivalry in all my years of coaching." The No. 3 Bruins and No. 2 Trojans meet again, this time in conference play at UCLA, on April 19th. Then Ojai, for the Pac-12 men's team tournament, and, most likely, in the NCAAs. Who would venture to guess which team will win any of those matches? Sunday is the first CollegeMatch day, with the No. 13 Stanford women playing No. 4 Florida in Gainesville. Both teams defeated No. 18 Clemson this weekend, with the Gators beating the Tigers 6-1 Friday and Stanford winning 5-2 today. The 2011 NCAA final rematch is scheduled for 11 a.m. and will be webcast by Ken Thomas at radiotennis.com. There is no charge for listening to Ken's call of the match. The qualifying for the ATP Delray Beach tournament includes many familiar young Americans, with Bradley Klahn, Chase Buchanan and Denis Kudla among those who won their first round matches. Jared Hiltzik, now a freshman at the University of Illinois, was in the qualifying, apparently as a result of his performance in the USTA Clay Courts last year, even though he and George Goldhoff ended up flipping a coin for the gold ball after the final was rained out. Hiltzik lost to Andrey Golubev of Kazakhstan 6-3, 6-4. I like to think that I'm familiar with most any US junior who ends up in the Top 20 of the ITA College Rankings. I've been going to major junior tournaments in this country for eight years and I keep a close eye on the draws of those tournaments I don't attend. But until two weeks ago, I had not seen 21-year-old Mary Weatherholt of Nebraska play more than a few shots (she lost in the first round of the NCAAs last year to eventual semifinalist Zsofi Susanyi of Cal 6-4, 7-5 and I think I saw a few points of that match). Curious to hear why she hadn't played much national-level junior tennis, I arranged to interview her at the ITA Women's Team Indoor in Charlottesville, and she explained how she had lost her passion for the game, and how she got it back. A five-star recruit in high school, Weatherholt is now ranked in the ITA Top 20, demonstrating how the right school and coaches can help a motivated and talented player improve every year. 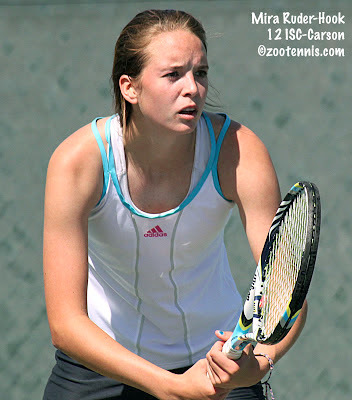 For more on Weatherholt, see my profile on the Tennis Recruiting Network. Speaking of Nebraskans, two-time Kalamazoo champion Jack Sock has reached the quarterfinals of the US National Indoors in Memphis, after beating Milos Raonic in the first round and James Blake in the second round last night. If you've watch Sock with any regularity, you know he is capable of hitting some eye-popping winners, and last night he came up with one of them, which can be seen here. Sports Illustrated's Courtney Nguyen wrote this piece on Sock's prospects, which she believes are very bright, and she points to his history of winning as one of the main factors in his favor. Qualifier Louisa Chirico reached the semifinals of the $25,000 Pro Circuit event in Surprise, Arizona, defeating fellow teen Sachia Vickery 1-6, 6-1, 6-2. Next for Chirico, who has now won six straight matches, is top seed Jarmila Gajdosova of Australia, ranked 165 in the world. Vickery's day ended well for her too, as she and Samantha Crawford reached the doubles final, where they will play another unseeded team: Yi-Fan Xu of China and Emily Harman (who played at Syracuse). At the Brownsville Futures, both Eric Quigley(Kentucky) and Bjorn Fratangelo lost in today's quarterfinals, but Dennis Nevolo(Illinois) and Jean-Yves Aubone(Florida State) reached the doubles final, where they will play the Philippines' Ruben Gonzales(Illinois) and Clint Letcher of Australia. 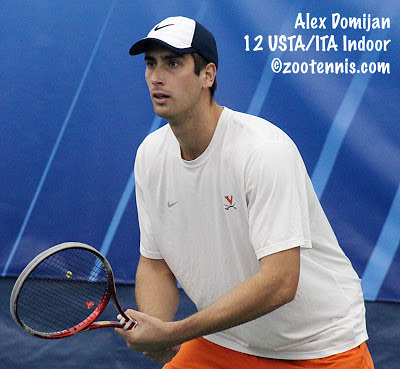 The ITA announced the All-Tournament Team for the Men's Indoor Championships today, with Virginia's Alex Domijan named the Most Outstanding Player for the second time in three years. For the complete release, see the ITA website. With my focus on college tennis the past couple of weeks, I didn't have a chance to mention the two Pro Circuit events in the United States this week, with the women in Surprise, Arizona for another $25,000 event, and the men in Brownsville, Texas for a $15,000 Futures. The quarterfinals for both are set for Friday, with 17-year-old Sachia Vickery and 16-year-old Louisa Chirico playing each other for a spot in the semifinals. Chirico, who qualified by winning three matches, including a 7-5, 6-2 decision over Ching-Wen Shu of Taiwan, currently 7th in the ITF Junior rankings, in the final round. Chirico also reached the quarterfinals of the $25,000 tournament two weeks ago in Rancho Mirage. Her two wins in the main draw have both been in three sets: over Elitsa Kostova of Bulgaria, ranked 277, in the first round and over No. 3 seed and former WTA Top 50 player Jill Craybas today. Vickery, who qualified and reached the second round at the Midland $100,000 tournament, received a wild card this week and defeated No. 8 seed Yi-Fan Xu of China in the first round. In today's second round, Vickery overcame fellow 17-year-old and future UCLA Bruin Jennifer Brady 6-3, 4-6, 6-1. Vickery and Chirico will meet for the first time on Friday. No. 7 seed Madison Brengle, who won last week in Rancho Santa Fe, is the only other American in the quarterfinals. Vickery and Samantha Crawford have reached the doubles semifinals. In Brownsville, where I gather from this article in the Brownsville Herald it has been very windy all week, Bjorn Fratangelo and Eric Quigley are the two American men in the quarterfinals. The unseeded Fratangelo will play 2011 ITF World Junior Champion Jiri Vesely of the Czech Republic, the No. 2 seed, and Quigley, also unseeded, meets No. 3 seed and former North Carolina State standout James Magee of Ireland. A couple of weeks ago the USTA announced three renewals and two new members in its Regional Training Center program. The renewals are T Bar M in Dallas, Eagle Fustar in Santa Clara, Calif. and Darling Tennis Center in Las Vegas. The new additions are the Five Seasons Sports Club in Northbrook, Ill. and The Smiths in Indianapolis. The Smiths are Jeff and his son Bryan, who coach Rajeev Ram, Brooke Austin, Ronnie Schneider, Samir Kumar and many other top national players. The USTA release can be found here. 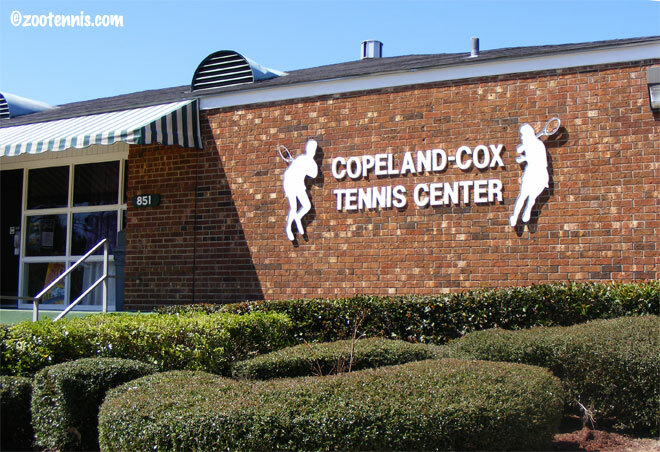 In a few weeks, I plan on covering the USTA 18s Spring National Championships at the Copeland -Cox Tennis Center in Mobile, Alabama which is one of the outstanding facilities in the country. Scott and Lorraine Novak serve as tournament directors for the seemingly constant tournaments there, and they do a fantastic job of it. 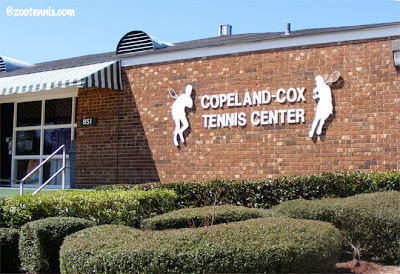 They also do a fantastic job of demonstrating how valuable the tennis center is to the city in terms of revenue, and the 2012 estimate, provided by a professor at the University of South Alabama, puts the number at over $54 million. This article in the Mobile Press-Register provides an overview, along with information on the resurfacing plans and the introduction of clay courts to the 60-court facility. A link to the complete study can be found in the article. In an effort to market college tennis more effectively, the USTA is introducing a College MatchDay, which in 2014 will spotlight an important college dual match every week of the team season. Based on the popular ESPN College Football GameDay, the College MatchDay will get a trial run this season with two matches, the Stanford women at Florida this Sunday, February 24th, and the Duke men at Virginia March 22nd. According to the release I received from the USTA, College MatchDay will feature "activities and local outreach surrounding the host team’s campus. Additionally, Ken Thomas will broadcast each College MatchDay on RadioTennis.com." As part of the USTA's repositioning of the Junior and Collegiate Competition area from Player Development to Community Tennis, there are now more resources available to college tennis, and Virgil Christian is now in the position of USTA Director, Collegiate Tennis and Market Development. Let's hope this provides increased exposure for the sport on the collegiate level, where the tension and excitement of a team format is waiting to be discovered by students and local tennis fans. For the release, see usta.com. This is the last week of polling for the team rankings. The computer takes over with next week's rankings, which will also feature new singles and doubles rankings. For the complete lists, see the ITA website. 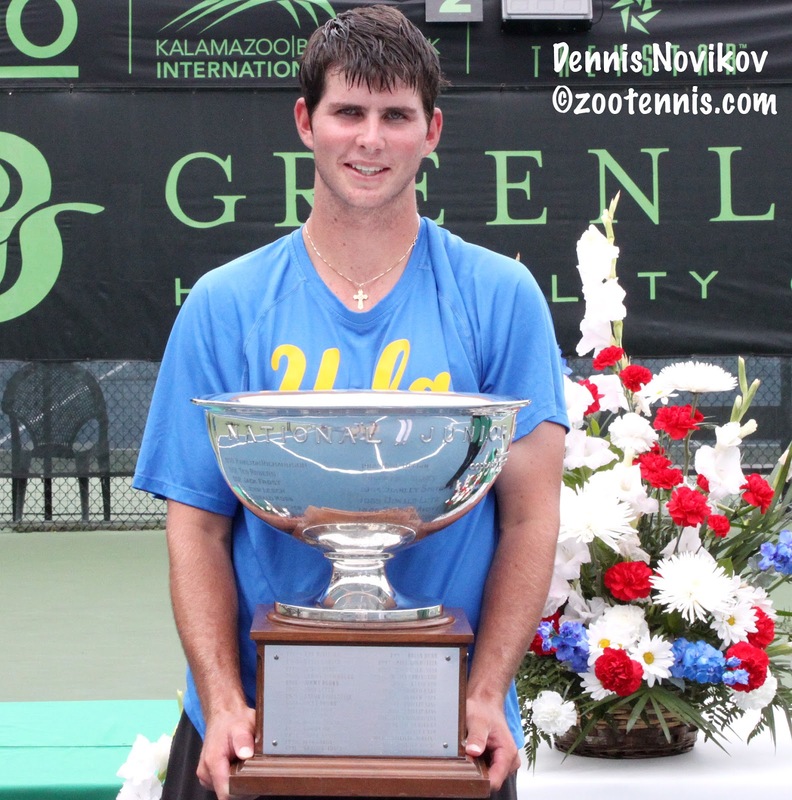 Dennis Novikov, the 2012 Kalamazoo 18s champion and a sophomore at UCLA, is the subject of usta.com's College Spotlight. Novikov reveals what he's gained from college tennis and UCLA coach Billy Martin assesses what Novikov has that many college players lack. One correction: the body and the caption both say that Novikov was the first Kalamazoo champion since Gimelstob to win a round at the US Open when he beat Jerzy Janowicz last year in New York, but Jack Sock had a first round win over Marc Gicquel of France as the Kalamazoo champion in 2011. And finally, the Tennis Recruiting Network published a question and answer piece today with retiring Notre Dame men's head coach Bobby Bayliss. Harry Cicma asks Bayliss about the highlights of his career at Notre Dame, and Bayliss answers in his own inimitable way. Here's hoping he finds time to write that book, "Cross Court Reflections," while staying involved as Director of Tennis Facilities at Notre Dame. 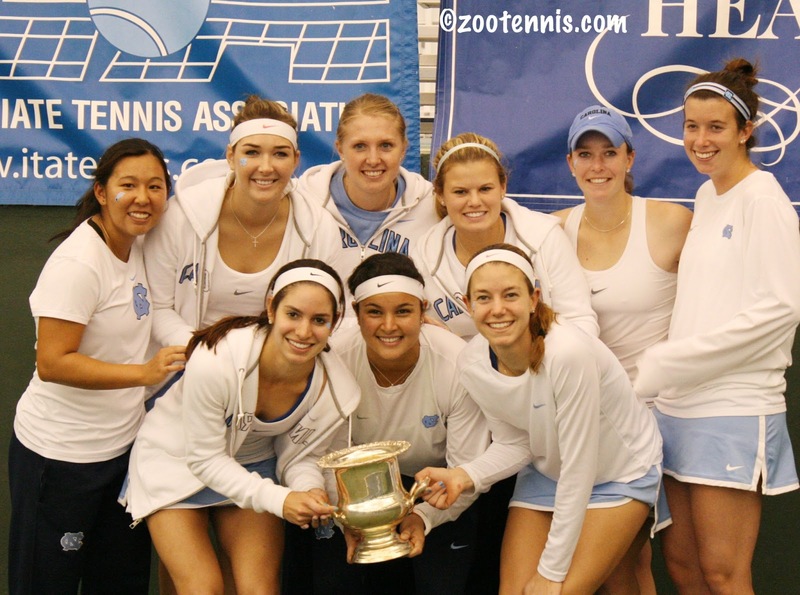 The rumor surfaced days before the final at the ITA Women’s Team Indoor Championships last week: North Carolina would join Stanford and Florida in declining to participate in the 2014 event, scheduled to be hosted again by the University of Virginia. Stanford and Florida have had a checkered history of participation in the event in recent years. In the 2007-2011 tournaments at least one of the Division I women’s tennis standard-bearers competed, but in the past two years neither have, instead establishing a home-and-home dual schedule between the two teams prior to the start of their conference seasons. "For us, we add two teams to the conference - Texas A&M and Missouri - and we have to play them. We're just not in a position to be able to play the Indoor qualifying," Thornqvist said. "That's two dates that we have to count, and we never get real teams, we get teams ranked 50-60 to come. So with the addition of the two conference teams, we just run out of competitive dates, frankly, so we would much rather next year play Clemson on a Friday and Stanford on a Sunday." "We're missing out on some points, and obviously when you do that, you have to keep a clean sheet the rest of the year," Thornqvist said. "Stanford found that out this year. So there's a risk to it, clearly, but then again we don't have a team that's made to play indoors per se. You go to the Indoors and play four consecutive days, so there are a lot of risks both ways, but as long as we can have a really quality out-of-conference schedule, I don't think we're dependent on the Indoor points." This logic made sense to North Carolina coach Brian Kalbas, who is also facing a conference expansion, with Pitt and Syracuse joining the ACC this year, and Notre Dame and Louisville also being added. "With our conference expansion, we’re having to play more teams in our conference," Kalbas said. "The Kick-off Weekend is two dates, and that would have meant that we wouldn’t play Florida. Florida and Stanford asked if we’d join in with them, and next year we’re having them come to our place and to have a chance to have Florida and Stanford on your home court is amazing." "I’m hoping [the ITA Women's Operating Committee] might make some adjustments to include everybody, whether they take the Kick-off out or something like that," continued Kalbas. "I heard rumors that they might make some changes. If that happens we’ll definitely play. " After talking with Kalbas in Charlottesville, I spoke to ITA Executive Director David Benjamin on the phone a few days later, and although he didn’t rule out changes in 2015, he said there won't be any for 2014, meaning that North Carolina will not be defending its championship next year. “It’s possible, looking ahead to 2015 and beyond, if there are more schools that decide they are not interested in playing in the Kick-off Weekend, we could make some changes, but not for next year,” Benjamin said. The Kick-off weekend, which began in 2009, is an innovative and democratic means of selecting the ITA Indoor participants, but unlike the Team Indoor tournament, which does not count against the NCAA's 25 dates per year limit, the schools are required to count the two Kick-off Weekend matches that serve as qualifying for it. Prior to the introduction of the Kick-off Weekend, teams were selected on the basis of their early season rankings, which were not computerized and based mostly on the previous season’s final rankings. As a reward for a good prior season, that method had its advocates, but it didn’t allow a team with an excellent freshman class or a team just outside the year-end Top 15 to play its way in. The Kick-off Weekend is now much like a fantasy draft, with the Top 15 in the prior season’s rankings (hosts of the Team Indoor get an automatic berth) receiving hosting privileges while the next 48 ranked teams decide which site they wish to visit, in order of their ranking. Coaches must assess their hosts’ strength the following year (the draft takes place right after the NCAA tournament), along with the strength of other teams that will be playing in their 4-team regional, with travel cost and time also a part of the equation. I’m a fan of Kick-off Weekend, believing it to be one of the many areas where college tennis demonstrates a willingness to create and experiment. (How much simpler would Davis Cup or Fed Cup be if they had a similar format for determining the final 16 teams?) I would hate to see it scrapped, but with North Carolina joining Stanford and Florida, there’s no denying an alarming trend is being laid at its feet. Here’s the easy one—get the NCAA to add two dates or make the Kick-off Weekend exempt from the 25 allowed. I’m assuming that’s not likely to happen, so what else can be done? The stick: Penalize schools for not participating in the ITA Team Indoor. The ITA Women’s Operating Committee has never approved a penalty for failure to participate, and the men no longer have one, which Benjamin believes is appropriate since the costs a school can incur are no longer picked up by the organization. “We had generous funding from the USTA and had local presenting sponsors, which covered almost all the expenses of teams playing the national event, men and women,” Benjamin said. I suggested bonus points for participating in the Team Indoor, enough to make it more attractive to play those two possibly non-competitive Kick-off Weekend matches. Benjamin said he thinks that would undermine the credibility of the rankings algorithm and even if the Women’s Operating Committee were to take that route, he doesn’t think it would prod Florida and Stanford into playing. In a sort of mash-up of the two methods, the semifinalists from the previous year’s NCAA team championships could be given byes into the tournament, exempting them from the Kick-off Weekend, while the 11 other spots would be decided as they are now (it should be noted Stanford would not have received a bye this year, as they lost in the quarterfinals at the NCAAs in 2012). Or the finalists from the previous year’s Team Indoor could be given entry. I don’t really like these options, but I am worried about the future of the Women’s Team Indoor. It has a stellar history since 1988, with Stanford(10) and Florida(6) winning more than half of the titles, just as their 22 NCAA team titles represents more than half of those championships. I would never argue against a coach deciding what is best for her team and program, but there is more at stake than just that, most notably the history of college tennis, which is decided not in a particular dual match, but it tournaments. Rankings are important but winning conference and national titles matters more. And having 16 of the country’s best teams gather in one place for a long weekend of competition is part of what it means to play college tennis. Several parents have told me how much they enjoy these opportunities to see their friends from the juniors again, in a competitive yet somehow more relaxed atmosphere than exists at major junior tournaments. This year’s title provided the University of North Carolina women’s team with a reason to be recognized for their accomplishment during a Tar Heels basketball game. Anyone who was lucky enough to witness the tiebreaker that decided the championship this year will never forget it. The opportunity to provide these kinds of memories must be preserved, and Benjamin believes they can be. "Things change, and we need to be flexible and we need to find a way to make it all work." The University of Virginia Cavaliers won their fifth ITA Men's Team Indoor final in the past six years Monday afternoon, defeating Southern California 4-2 at the Nordstrom Tennis Center in Seattle, Washington. After the two thrillers in the semifinals yesterday, with No. 1 Virginia beating No. 4 Ohio State 4-3 and No. 2 USC defeating No. 3 UCLA 4-3, both after dropping the doubles point, an emotional letdown might have been expected. But two veteran coaches who have been in big matches with great regularity over the past six years had the experience to keep their teams on course, and signs of a letdown were few. Virginia took the doubles point, with not much resistance from the Trojans, with Alex Domijan and Mitchell Frank winning 8-4 over Eric Johnson and Emilio Gomez of USC at line 3, and Justin Shane and Julien Uriguen taking an 8-3 decision over Roberto Quiroz and Max de Vroome at line 2, with the match at 1 unfinished. In last year's final against Ohio State, USC had also dropped the doubles point, yet managed to win four singles matches from the Buckeyes to post a 4-3 victory. Virginia won first sets at 1, 2, and 3, while USC took the first sets at 4, 5, and 6, so the Trojans needed a comeback if they were to repeat. Virginia made it 2-0 with Domijan's 6-3, 6-2 victory over Gomez at line 2, while a few minutes later USC got on the board with Johnson's 7-5, 6-4 win over Justin Shane at line 6. Almost immediately, Jarmere Jenkins closed out Raymond Sarmiento 6-2, 6-4 at line 1, making it 3-1 for Virginia, and forcing USC to face the prospect of winning the last three matches on the court. At line 4, Virginia's Mac Styslinger had forced a third set with Yannick Hanfmann, the hero of last year's USC Indoor title, but de Vroome finished his 7-6(4), 6-3 win over Ryan Shane at line 5 to give USC its second point. Mitchell Frank was down a break in the second set to Quiroz at line 3, having won the first, but when de Vroome finished, he had brought it back to 5-5 in the second set. Serving at 5-5, Frank saved two break points, then went on to hold, putting Quiroz in the tough spot of needing to hold to reach a tiebreaker, which he then had to win to extend the match. 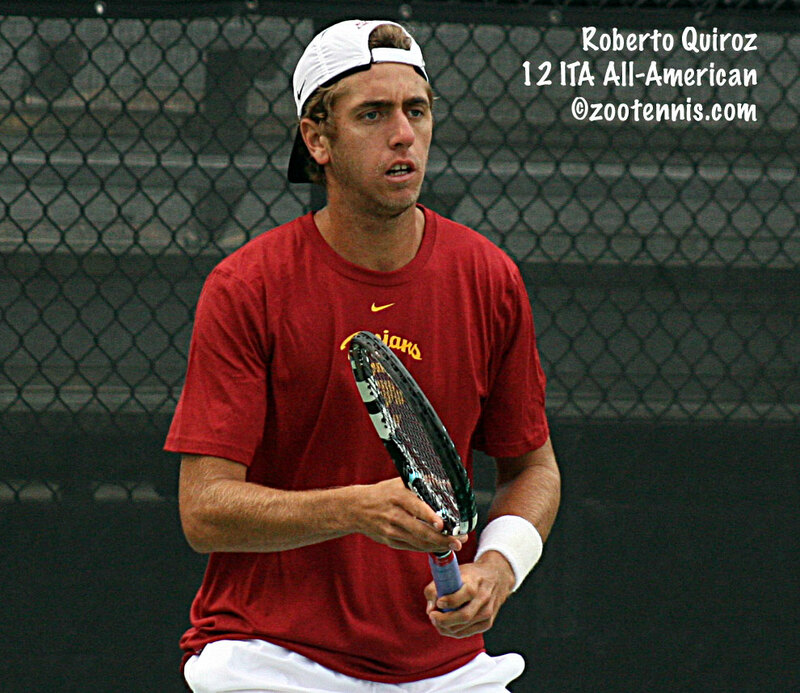 Quiroz had survived the pressure of a third set tiebreaker to decide his match with UCLA's Adrien Puget, which gave USC the 4-3 win on Sunday, but he took several chances in that final game, coming into the net, and Frank did not miss, breaking at love on a forehand pass to return the Team Indoor trophy to the Cavaliers. For more on the final, with reaction from coach Brian Boland and Frank, see the Virginia sports website. In a match that began at 2 p.m. and finished after 6:30, the second-ranked Florida women put their shutout loss to Duke on Sunday emphatically behind them by defeating No. 1 North Carolina 4-2 in Chapel Hill. The doubles point, which was played conventionally with advantage scoring and a tiebreaker at 8-all, took nearly two hours, with North Carolina winning it in just such a tiebreaker. Gina Suarez-Malaguti and Zoe De Bruycker defeated Florida's Danielle Collins and Olivia Janowicz at line 2 to clinch the point, after Florida's Lauren Embree and Sofie Oyen had beaten Whitney Kay and Ashley Dai 8-3 at line 1, and North Carolina's Tessa Lyons and Lauren McHale had downed Alex Cercone and Brianna Morgan 9-7 at line 3. The Gators took four first sets in singles, but they could get straight-set wins in only two of them, with Janowicz beating Lyons 6-2, 6-1 at line 6 and Morgan defeating McHale 6-1, 6-1 at line 4. The Tar Heels picked up their second point with Caroline Price's 6-4, 6-2 win over Collins at line 5, and the score was 2-2 as the matches at line 1, 2, and 3 went to third sets. Embree got Florida's third point with a 6-4, 1-6, 6-2 victory over Suarez-Malaguti, and Oyen completed her comeback with a 3-6, 6-1, 6-3 win over De Bruycker to clinch the win for the Gators. By skipping the Team Indoor, Florida puts itself in the position of needing to get non-conference wins over quality opponents to keep their ranking high once the computers begin to rate teams, and going 0-2 against the top two teams in the ACC this weekend would have been difficult to overcome. But bouncing back from the loss to Duke and the loss of today's grueling doubles point indicates the Gators remain one of the favorites for this year's NCAA title. At the women's WTA event in Memphis, 17-year-old Vicky Duval picked up her first victory at that level, defeating 69th-ranked Johanna Larsson of Sweden 3-6, 6-1, 6-3. Duval, ranked 451, had a win over CoCo Vandeweghe in the main draw of the $100,000 Midland tournament earlier this month as a lucky loser, but this is her first win in an official WTA event. In the renewal of the Steve Johnson and Rhyne Williams college rivalry, Williams got the victory in the ATP event in Memphis, 7-6(4), 6-4. Williams faced only one break point in the match and saved it, earning his second consecutive win over the two-time NCAA champion, whom he beat in the Charlottesville Challenger in November. Former Tennessee Volunteer Williams was 2-1 against USC's Johnson in college, but Johnson won their last meeting there --Williams' last college match ever--in the final of the 2011 NCAA singles championships. For more results from Monday's action in Memphis, see the tournament website. Monday's ITA Men's Team Indoor final between No. 1 Virginia and No. 2 Southern California is an exciting prospect, but it is unlikely to approach those two teams' semifinal wins when it comes to drama. Both Virginia and USC took 4-3 decisions, with Cavalier Alex Domijan winning 7-5 in the third over Peter Kobelt of Ohio State, and Trojan Roberto Quiroz capturing a third set tiebreaker over UCLA's Adrien Puget to put their teams in the final. No. 3 seed UCLA won the doubles point, without any notable struggle, getting wins from their No. 1 team of Dennis Novikov and Marcos Giron and No. 2 team of Puget and Karue Sell. The teams split first sets, but never has a first set in hand meant so little. With the exception of court 5, where Yannick Hanfmann of USC defeated Dennis Mkrtchian 6-2, 6-4, every player who won the first set ended up losing his match. After Hanfmann made it 1-1, Bruin Dennis Novikov completed his comeback over Raymond Sarmiento 1-6, 6-3, 6-4 at line 1, then USC's Eric Johnson tied it up with a 1-6, 7-5, 6-4 win at line 6, saving match points in the second set. USC took a 3-2 lead with Emilio Gomez's 2-6, 7-5, 6-2 win over Marcos Giron at No. 2, then Clay Thompson of UCLA tied it up with a 2-6, 6-4, 6-4 win over Max de Vroome at No. 5. By this time sophomore Roberto Quiroz of USC was up 5-4 in the third set against Puget at No. 3, but Puget, closing the net aggressively at every opportunity, broke Qurioz quickly to make it 5-5. Because I am not in Seattle, I had to rely on the live stream, which is a great option, but unable to hear the chair umpire calling the score, I can't be quite as sure as of the score as when I am in attendance. I believe Puget saved a couple of match points late in the third set, but in the tiebreaker, he fell behind 4-2, then 6-3 after a costly double fault. Quiroz netted a backhand on his first match point in the tiebreaker, but the left-hander from Ecuador hit an ace on his next serve, giving him a 3-6, 6-3, 7-6(4) win and his team a chance to defend its title on Monday. UCLA and USC play again in a non-conference match on Friday, at USC, which I suspect will be another of the dogfights the crosstown rivals will engage in this year. Virginia dropped the doubles point to No. 4 Ohio State, with the Buckeyes picking up wins at the No. 2 and No. 3 positions, with No. 1 unfinished. Unlike the USC - UCLA match, there was only one three-set match in the singles: Domijan's win over Kobelt that decided it. Blaz Rola gave Ohio State a 2-0 lead with a 6-4, 6-2 win over Jarmere Jenkins at No. 1, before the Shane brothers tied it up for Virginia. Justin Shane defeated Hunter Callahan at line 6 by a 7-5, 6-3 score, and Ryan Shane took out Chris Diaz at No. 5 6-4, 7-6(6). Mitchell Frank made it 3-2 for Virginia with his 6-4, 6-2 win over Devin McCarthy at line 3, a very innocuous score for what was a very long, tough match. With Kobelt forcing a third set against Domijan, Ohio State needed Connor Smith to close out Mac Styslinger at No. 4, which he did, 6-4, 7-6(4), making it 3-3. Domijan and Kobelt, the 2012 ITA All-American champion and finalist, respectively, were at 5-5 in the third set when Smith won. Domijan held for 6-5, and Kobelt had several game points serving to send it into a tiebreaker, but he didn't convert them, eventually leading to a match point for Domijan. Kobelt missed his first serve, got his second in, but missed a volley on the far sideline. Kobelt didn't agree with Domijan's call, and asked the chair umpire to overrule, but the call stood, putting Virginia back in the Indoor final for the fifth time in the past six years. In women's dual match non-conference action, No. 4 Duke defeated No. 2 Florida 4-0 in Durham, the first time the Blue Devils have ever blanked Florida. Duke won the doubles point and got singles victories from Monica Turewicz at 4, Ester Goldfeld at 2 and Marianne Jodoin at 6. The experiment with no-ad in doubles is apparently over, with the doubles point taking nearly two hours (!) according to the Duke release. Next up for Florida is No. 1 North Carolina Monday afternoon in Chapel Hill. The US National Indoor Championships, the joint WTA/ATP event in Memphis, completed its qualifying rounds today, with Madison Keys, Maria Sanchez and Rhyne Williams among those advancing to the main draw. On Monday's schedule are Sanchez, who plays Lesia Tsurenko of Ukraine, and wild cards Vicky Duval and Courtney Collins, a senior on the University of Memphis women's team. Williams has been placed against wild card Steve Johnson in tomorrow's first round, a repeat of the 2011 NCAA singles final, which Johnson won. Williams earned the win in their most recent meeting, in the second round in the Charlottesville Challenger, which, like the NCAA final, went three sets. At the $25,000 women's Pro Circuit event in Rancho Santa Fe, Madison Brengle defeated Stanford junior Nicole Gibbs 6-1, 6-4 in the singles final. I'm still waiting for that memorable 4-3, down-to-the-last-match contest in the ITA Men's Team Indoor, after the top four seeds advanced to the semifinals Saturday in Seattle by either 4-1 or 4-0 scores. No. 6 Georgia took the doubles point from No. 3 UCLA, but playing without KU Singh (coaches' decision) and Nick Wood (illness), the Bulldogs were unable to overcome the Bruins' strong singles lineup. UCLA got wins from Karue Sell at 6, Clay Thompson at 5, Dennis Novikov at 1 and Adrien Puget at 3. UCLA will play No. 2 seed USC in the semifinals after the defending champions defeated No. 7 seed Kentucky 4-1. USC took the doubles point, but lost the point at No. 1 for the first time in over two years, as Kentucky's Anthony Rossi defeated Raymond Sarmiento 6-3, 6-4. The Trojans already had a 3-0 lead by that time however, getting wins from Roberto Quiroz at No. 3 and Yannick Hanfmann at No. 4, with Max de Vroome closing out the win at No.5. I was expecting the match between No. 5 Pepperdine and No. 4 Ohio State to be close, but the Buckeyes took charge at the bottom of their lineup after taking the doubles point and eased to a 4-0 win. Hunter Callahan clinched at 6, after Connor Smith at 4 and Chris Diaz at 5 had taken straight-set wins. Ohio State will hope to duplicate their upset of Virginia in last year's Team Indoor semifinal on Saturday, and this year they get the Cavaliers at a neutral site in Seattle rather than in Charlottesville. Top seed Virginia took a close doubles point from No. 9 seed Duke and posted singles wins by Alex Domijan at 2, Justin Shane at 6 and Jarmere Jenkins at No. 1 for a 4-0 win. Duke's No. 1, Henrique Cunha, played in doubles but was pulled from the lineup in singles, yet despite his absence the Blue Devils took all but two singles matches to three sets. Ohio State and Virginia will play the 2:30 p.m. match Sunday, with USC and UCLA scheduled for 11 a.m. Complete results are available at the ITA tournament site. No surprises in the Men's Team Indoor didn't mean no surprises in college tennis Saturday, with a shocker of a a result coming out of Palo Alto. The No. 7 Stanford Cardinal women lost to No. 45 Saint Mary's 4-3 at home, only their third loss at the Taube Family Tennis Center since 1999. Saint Mary's took the doubles point and picked up singles wins from Jenny Jullien at 1 and Danielle Flores at 3, with Catherine Leduc clinching it at 5. Nicole Gibbs, who would have been playing No. 1 for Stanford had she been there, was instead in in Southern California, at Rancho Santa Fe, where she reached the final of the $25,000 Pro Circuit event with a win Saturday. Gibbs, the No. 2 seed, will play No. 6 seed Madison Brengle in Sunday's championship match. The two last played at the $100,000 Vancouver Challenger in August, with Gibbs taking a 6-4, 2-6, 6-2 victory in the first round. Neither has lost a set in advancing to the final this week. The doubles title went to unseeded Asia Muhammad and Allie Will, who defeated former college standouts Macall Harkins(TCU) and Anamika Bhargava (Pepperdine), also unseeded, 6-1, 6-4. For more on the Rancho Santa Fe final see this release. 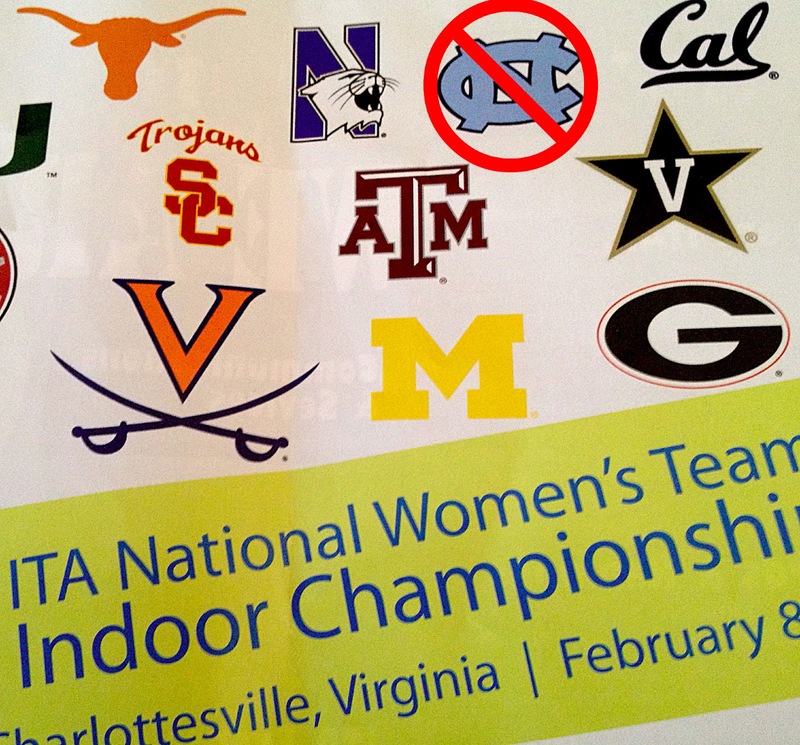 My recap of the ITA Women's Team Indoor, which ended with North Carolina's tense 4-3 win over defending champion and top seed UCLA is available now at the Tennis Recruiting Network. The All-Tournament team was announced today, with a predictable winner of the Most Outstanding Player award--North Carolina freshman Whitney Kay. Kay won two deciding matches, in the quarterfinals and finals, an incredible performance given the pressure and her inexperience on the collegiate level. At the ITA Men's Indoor in Seattle, which I am not covering in person, four of six matches completed as of 9 p.m. Eastern time went to the higher seed by a 4-0 score. No. 6 Georgia's 4-0 win over No. 12 Ole Miss was the closest of the shutouts, but it was particularly impressive because Georgia is playing without their No. 1, KU Singh, who did not make the trip due to "coaches' decision." Georgia won the doubles point and got singles wins from junior Garrett Brasseaux at 6, Nick Wood at 4, and Austin Smith at 5. I was expecting a tight match between No. 2 USC and No. 15 Texas A&M, but it didn't materialize, at least not in the singles. Shane Vinsant did not play for the Aggies in singles and the defending champions got straight-set wins from Raymond Sarmiento at 1, Max de Vroome at 5 and Yannick Hanfmann at 4. The ease of No. 7 Kentucky's 4-0 victory over No. 10 Mississippi State also came as a surprise. After the Wildcats quickly took the doubles point, the got wins from No. 2 Tom Jomby, No. 6 Kevin Lai and No. 5 Grant Roberts. They play USC at 11 a.m. Pacific time Saturday. Georgia's quarterfinal opponent is No. 3 UCLA, who beat Tennessee 4-1. Although the Bruins didn't struggle overall against No. 14 Tennessee, Dennis Novikov lost at No. 1 to Mikelis Libietis 6-3, 6-4. UCLA got wins from Marcos Giron at 2, Dennis Mkrtchian at 4 and Karue Sell at 6. No. 4 Ohio State will play No. 5 Pepperdine in what should be the best quarterfinal contest after the Buckeyes blanked No. 13 California and Pepperdine beat Florida 4-1. After a fairly close doubles point, Ohio State got wins from Blaz Rola at No. 1, Christopher Diaz at No. 5 and Hunter Callahan at No. 6. Live scoring at the Seattle Tennis Club has been unreliable, but I think Pepperdine won the doubles point and received points from No. 1 Sebastian Fanselow, No. 2 Finn Tearney and No. 4 Francis Alcantara. Florida's Alford picked up the Gators' point at No. 5. The remaining two matches tonight are No. 1 Virginia against No. 16 Washington and No. 8 Oklahoma versus No. 9 Duke. See the ITA results page for all scores. I received the following statement via email from Duke All-American Beatrice Capra regarding her dismissal from the university last month for violation of school policy. The school's announcement is here. In addition to asking Capra about her dismissal, (I had sent her an email with several questions, requesting a response from her, shortly after the school's announcement), I also inquired about her health, as she did not compete regularly in the summer and fall. "I have been suspended for an academic code violation. The violation consisted of handing in an incomplete final paper, lacking proper finalized citations to research sources. My actions were not intentional but I take full responsibility for my mistakes. As a student/athlete, I’ve worked hard to maintain close to a 3.0 GPA and complete extra academic credit requirements. I feel terrible that I disappointed my family -- as well as my teachers, coaches and teammates – but I am committed to learning and moving forward. Currently, I have resumed training with my coaches at the Evert Tennis Academy. I also continue to take college courses and look forward to returning to school in the fall. Towards the end of last season and through the NCAA’s, I played with a stress fracture in my left foot. After rehabbing for two months, I probably came back too soon and ended up tearing the patella in my left knee – which led to tendonitis in my right knee. I only played one doubles tournament in the fall, due to the combination of these injuries. I am doing strength and conditioning training but am still limited to practicing only about an hour a day on clay. I want to thank all the people who reached out to me and supported me during this difficult period." In addition to losing Capra for this season, Rachel Kahan recently had Tommy John surgery and will not play for the Blue Devils for the remainder of the season. 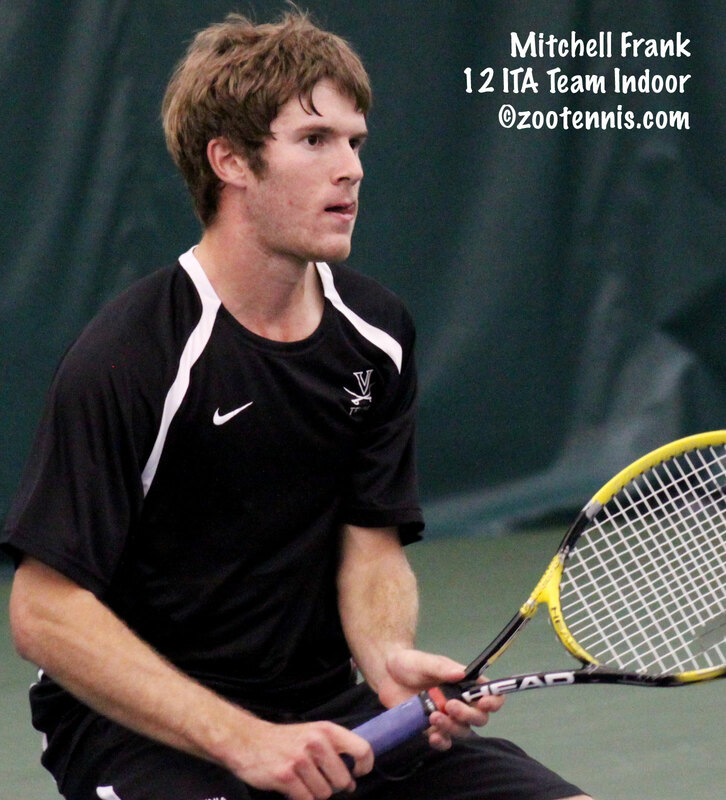 The ITA Men's Team Indoor begins Friday morning in Seattle, with No. 6 seed Georgia facing No. 12 Ole Miss and No. 14 Tennessee squaring off against No. 3 UCLA at 8 a.m(Pacific). The 11 a.m. matches are No. 10 Mississippi State vs. No. 7 Kentucky, another all-SEC battle, and No. 15 Texas A&M vs. No. 2 USC. After Texas A&M's 4-3 win over Ohio State on Sunday in College Station, the Aggies instantly became a dangerous first round opponent, and the defending champion Trojans will not have the luxury of working their way into the tournament. The 2:30 matches are No. 4 Ohio State versus No. 13 California and No. 5 Pepperdine against No. 11 Florida. The 5:30 matches feature No. 8 Oklahoma versus No. 9 Duke and top seed Virginia against No. 16 seed and host Washington. The ITA page for live scoring and video, as well as results, is here. The ITA tournament preview can be found here. 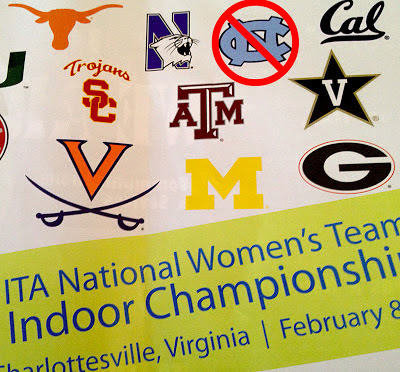 From conversations I had in Charlottesville, I can confirm the rumor that champion North Carolina is unlikely to play in the Women's Team Indoor next year, joining Stanford and Florida in electing not to compete in this national team championship. I will have a complete post about this topic in the next few days. Although February is a quiet month for major ITF junior tournaments, the lower level events continue at their usual pace, presenting younger players with an opportunity to gain points and experience while the older juniors frequently compete in low level pro events. Thirteen-year-old Michaela Gordon, who reached the semifinals at Aegon Teen Tennis and the quarterfinals at Les Petits As, moved from Europe to Mexico City for a Grade 4 there, just the third ITF junior tournament of her career. Gordon won it unseeded, dropping only one set in her six wins and defeating No. 4 seed Olivia Hauger of the US 6-4, 6-4 in the final. Emma Critser of the US teamed with Ayla Aksu of Turkey to win the doubles title. In New Zealand, Mira Ruder-Hook won her second ITF Grade 4 of the year there last week, running her record in three tournaments In New Zealand to 13-1. The 16-year-old from Denver, seeded 11th, beat No. 13 seed Mayu Okawa of Japan 6-0, 6-3 in the final. At the beginning of the year, her ITF junior ranking was outside the Top 1000; it is now at 369. The Grade 2 Inka Bowl in Peru produced one US winner, with Farzin Danny Amiri taking the doubles title with Kevin Major of the Bahamas. Madison Bourguignon and Dasha Ivanova of the US reached the singles semifinals. Orange Bowl 16s champion Gloria Liang of Canada won the title. Seventeen-year-old left-hander Yoshihito Nishioka of Japan qualified into the $15,000 Futures in Mexico last week and ended up winning the tournament without dropping a set in any of his eight wins. He beat former Tulsa No. 1 Marcelo Arevalo of El Salvador 6-2, 7-6(4) in the final. It is the first Futures title for the 2012 US Open boys championships semifinalist. Former Texas Longhorn Ed Corrie continued his great start to 2013 with his second Futures title of year in his home country of Great Britain. The 24-year-old Corrie, who is 16-2 this year in Futures play, finished his straight-set run through the $10,000 tournament's draw with a 6-4, 6-1 win over Daniel Smethurst of Great Britain in the final. Corrie's only two losses this year have come to Americans: Eric Quigley and Christian Harrison. Former LSU Tiger Neal Skupski won the doubles with Lewis Burton, also of Great Britain. Former Ohio State Buckeye and 2009 NCAA finalist Steven Moneke won his fifth Futures title and his first outside of his home country of Germany last week in Turkey. The No. 6 seed, Moneke, 26, beat teenage qualifier Mathias Bourge of France 6-2, 6-3 in the final of the $10,000 tournament. Moneke, who is at a career-high 345 in the ATP rankings, will go higher once those points are added, which should help him get into qualifying of challengers, a welcome step up from continuing on the financially ruinous Futures circuit. 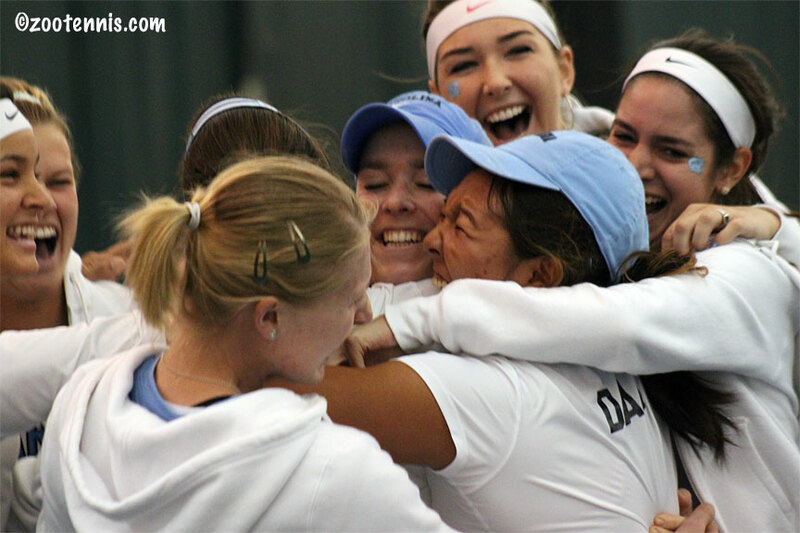 Their dramatic win over UCLA Monday not only gave the University of North Carolina women the ITA National Team Indoor Championship, but also vaulted them to the top of the latest rankings released today. There were no new rankings for the men, who begin play Friday in their National Team Indoor in Seattle. The draw is out, with Virginia and Southern Cal the top two seeds. In the latest individual rankings, there is a tie atop the women's singles, with Sabrina Santamaria of USC and Zsofi Susanyi of Cal at No. 1, replacing Sofie Oyen of Florida, who is now ranked No. 9. Alex Domijan of Virginia, one of three Cavaliers in the Top 8, takes over the No. 1 spot, with former No. 1 Peter Kobelt of Ohio State falling to No. 2. Complete rankings can be found at the ITA website. Ben Rothenberg, who writes about tennis for the New York Times, was in Charlottesville on Saturday, and he examined the dearth of women college players in the upper reaches of the WTA rankings in this newspaper article. Because I was in Charlottesville all weekend, I wasn't able to follow the late stages of the Challenger of Dallas and the Dow Corning Tennis Classic in Midland, Michigan as much as I would have liked, but I do know that two juniors that I followed for many years picked up their first titles at that level. 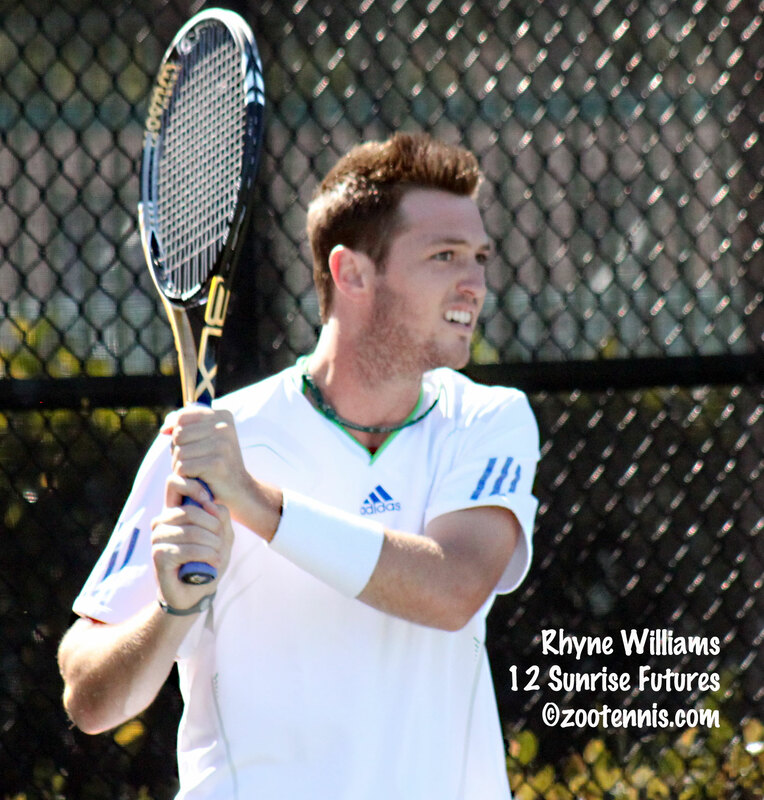 Former Tennessee Volunteer Rhyne Williams collected his first Challenger title, beating wild card Robby Ginepri 7-5, 6-3 in the final. Williams, who was unseeded, moved to a career-high ATP ranking of 159 with the victory. He and Tennys Sandgren also made the doubles final, but lost to Misha Zverev of Germany and Alex Kuznetsov 6-4, 6-7(4), 10-5. The Dallas Morning News has more details about the final in this article. Nineteen-year-old Davis was the top seed in Midland, but she had anything but a smooth road to the final, needing three sets to complete four of her five victories. In the final against unseeded fellow teen Ajla Tomljanovic of Croatia, Davis needed a third-set tiebreaker to collect her biggest tournament title of her pro career, taking the match 6-3, 2-6, 7-6(2). The win brought her ranking to 77, which is a career high. For more on Davis' win, see this article from the Bay City Times. There is no Pro Circuit action in the US this week for men, but there is another $25,000 Event in California for the women, after qualifier Sachie Ishizu of Japan won last week's Rancho Mirage $25K title over top seed Julie Coin. US teens Louisa Chirico and Jan Abaza reached the doubles final before losing to Great Britain's Tara Moore and Melanie South 4-6, 6-2, 12-10. This week in Rancho Santa Fe, qualifying is now complete, with juniors Jennifer Brady, Viktoriya Tomova and Mayo Hibi among the qualifiers. Christina Makarova and Louisa Chirico received wild cards. Nicole Gibbs of Stanford, who lost to Lorraine Guillermo of Pepperdine in Sunday's dual match in Malibu, has already advanced to the second round, as the No. 2 seed. The top seed is Irena Pavlovic of France. There were other notable results in both ITF junior and men's circuits last week, which I will recap on Wednesday. By the narrowest of margins, no wider than the broken string on Bruin Pam Montez's racquet in the third set tiebreaker of the deciding match, the University of North Carolina squeezed past defending champion UCLA 4-3 Monday afternoon, claiming the ITA Women's Team Indoor Championship, the first national team title in the program's history. With the match tied at 3-3, all eyes at the Boar's Head Sports Club were on court 3, with Kay up a mini-break 4-3 in the third set tiebreaker and serving. Early in the point, the unmistakable plink of a broken string came from Montez's racquet. The senior from Mexico, who has a delicate touch and had already hit a drop volley winner earlier in the pressure-packed tiebreaker, kept the rally going in spite of her handicap, hitting deep looping shots four or five times before a big forehand by Kay was finally too much for Montez, and her response sailed way beyond the baseline. It was 5-3 for Kay, instead of 4-4, and when Kay hit a clean backhand winner on the next point, Montez was facing three match points. She saved two on her serve, one on a forehand putaway and one on Kay's missed backhand return, but not the third. Eager to get to the net, Montez hit her approach shot straight up the middle and Kay passed her with a well-struck forehand to set off the championship celebration for the Tar Heels. "It's obviously hard for her, breaking a string on a really big point like that," said Kay, a freshman from Alpharetta, Ga. "But it's also hard for the person on the opposite side of the court, because you think, I can't lose the point to a person with a broken string. It's hard, because you don't want to go for too much, just keep the ball in the court and wait for your opportunity." UCLA coach Stella Sampras Webster was philosophical about the unfortunate timing of Montez's broken string. "It was just bad luck," said Sampras Webster, whose team had played in three consecutive National Team Championships, also losing in the NCAA final last May. "Sometimes we get breaks, sometimes we don't get breaks, so that's just the way it is. That's life. But Pam fought hard and it was a great match." North Carolina coach Brian Kalbas thought Kay might have wasted her opportunity to win the match when she had her first match point with Montez serving at 4-5, 30-40 in the third set. After hitting a couple of big forehands and getting Montez on the defensive, Kay approached the service line and had the ball right where she wanted it for a swinging forehand volley, but it caught the tape, and Montez held for 5-5. "It was tough at the time, because that's a shot I usually don't miss," said Kay. "I thought I had it. But I was thinking it needs to be one point at a time. I need to come back from that and just play my game." Kalbas had seen Kay come through in a similar circumstance in the quarterfinals against USC's Zoe Scandalis, going from 3-0 down in the third set to a 6-3 win in another last-match-on situation. But against Montez, Kay wasn't getting any free points. "You've got to beat her," said Kalbas of Montez. "She made zero unforced errors in that third set. Whitney got a little nervous on that first match point, on that swinging volley, but just like she did against Southern Cal, she composed herself and did a amazing job of finishing it off." For all the excitement at the end of the match, there was precious little at the beginning, when UCLA took an early lead on all three doubles courts and less than 50 minutes later had pocketed the point. Freshmen Kyle McPhillips and Catherine Harrison were first off the court for UCLA, beating North Carolina's Lauren McHale and Tessa Lyons 8-4 at line 3. Courtney Dolehide and Montez of UCLA also had a big lead at 2 over Gina Suarez-Malaguti and Zoe De Bruycker, but it was Robin Anderson and Skylar Morton who delivered the second win, beating Kay and Ashley Dai at line 1 8-6, winning a deciding point in the no-ad scoring to take the match on their serve. Fortunately for the Tar Heel fans scattered around the courts, their team had recent history to console them. Against No. 3 seed USC in the quarterfinals, North Carolina had also dropped the doubles point, and yet had found a way to win four singles matches from one of the best lineups in the country. "I think the other night helped a lot," said Kay. "Seeing that we could lose the doubles point and still come back and win. Obviously, it was a little discouraging at first, but we all came out and fought for it." North Carolina announced their intentions early in the singles, going up a break in the first set on five of the six courts. They held on to four of those, with Suarez-Malaguti, Kay, Caroline Price and Lyons taking first sets. UCLA's two first sets came from Chanelle Van Nguyen at line 4 and, eventually, Kyle McPhillips at line 2. McPhillips and De Bruycker battled for nearly an hour before McPhillips took a 4-3 lead in the first set, but McPhillips won the last two games quickly to give UCLA hope. Van Nguyen added to that optimism by earning UCLA's second point with a 6-4, 6-0 win over Lauren McHale. Montez, who was down 3-0 to Kay in the second set after losing the first 6-2, won six of the next seven games to earn a split. Anderson, down 4-1 in the second set to Suarez-Malaguti on court 1, had gotten back on serve at 4-4, but she wasn't able to sustain that momentum, with Suarez-Malaguti holding and breaking to give the Tar Heels their first point. By then De Bruycker was nearing a split with McPhillips, and Price, who had dropped the second set to Catherine Harrison on court 5, was up 3-0 in the third. Lyons, who did not play in the Tar Heels semifinal win over Duke, pulled North Carolina even with a 6-1, 6-4 victory over Dolehide on court 6. Less than five minutes later, Price finished off Harrison 6-2, 2-6, 6-2 to give North Carolina its first lead of the day, and trailing 3-2, UCLA had to win both matches still on courts 2 and 3 to retain their title. Both matches were early in the third set, with Kay leading 2-1 on serve and McPhillips and De Bruycker just beginning their third set. McPhillips and De Bruycker started with three breaks of serve until McPhillips held for 3-1, and when she earned her second break and a 4-1 lead, it was apparent that court 3 would decide it. Kay had two golden opportunities to end the match slip by with Montez serving at 3-4. At 15-40, Kay had two break points to serve for the match, but four straight Kay unforced errors later, Montez had held. After failing to seize her match point in Montez's next service game, it appeared Kay may have let too many chances go by, but holding her serves relatively easily in her last two service games helped ease her into the tiebreaker. Kay had her 6-3 lead in the tiebreaker before McPhillips finished off De Bruycker 6-3, 2-6, 6-2, getting the win that UCLA had to have. But three points later, it didn't matter, with Kay surviving more pressure than she would ever have faced in her illustrious junior career. "I was a lot more nervous about it today," said Kay, who said she primarily felt excitement during her win over Scandalis in the quarterfinals. "I was excited, but I was a lot more nervous. I just think one point at a time, and try to block the crowd out. It was getting really loud, but I can usually ignore them." As the volume rose, culminating in the Tar Heels celebrating their first team national championship, the tension that built up over the four-hour contest left spectators and players and coaches alike shaking after its release. Asked if he thought his team was the best in the country now, Kalbas said, "maybe for one weekend." "We definitely had the hardest road to the championship," added Kalbas, whose team defeated No. 3 seed USC, No. 2 seed Duke and top seed UCLA in successive days. "We've got amazing competitors on this team, and we just never give up. We fight and stay together and we're a very close team. I think those things speak volumes when it comes down to close matches like that. I'm really excited and happy for our program and our players, to win this and have it be the first time for our program." Sampras Webster was equally proud of her team. "It was great tennis. Pam I'm really proud of," said Sampras Webster. "Whitney Kay played unbelievable. We didn't lose that match, Whitney played well. I'm really proud of my team. We've grown a lot here, and I'm happy to see the way my team's coming together. It was a good tournament for us."